This morning I ran my second half marathon and the results were (happily) better than the first. 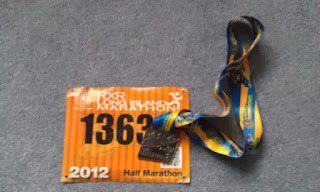 I finished the race almost 14 minutes faster than last year. All those weekends at Bethpage clearly paid off, and a healthy knee took care of the rest. My day started early and I was joined by my friend TC who came by my house at 6:00 AM. We did last minute preparations, like pinning bib numbers and packing our gear bags, before we headed over to Eisenhower Park. The roads were clear and we made good time. We quickly found parking spots and walked over to Charles Lindbergh Boulevard where the start of the race was being staged. In our excitement we forgot to take notice of where we'd parked. It was something we'd regret later. Even though we were early, the crowd was already large. It quickly grew to thousands and, before we knew it, race time had come. Last year there was a dearth of porto-pottys and this year it appeared as though they'd doubled the number. That made things much easier for people and prevented the need to use the grounds along the starting line as ad hoc facilities. I located a spot in the 9:00 pace range and after some unexpected fireworks, the crowd was off. With over 5,000 runners on the move, we basically shuffled past the starting line. It was good that the race provided a starting line sensor that captured net times for runners, but for some odd reason "official" times are calculated from gun time. Consequently, my "official" pace was based on a time that was three minutes longer than my actual time. It's a bad policy because it punishes people who follow the rules and line up at their pace range, rather than move to the front of the line. I really don't understand that. Since they record the runner's net times, why don't they use them? But while this race is about performance, it's also about the experience. Knowing what to expect after running the race last year really helped me manage my expectations. The loop around Nassau Coliseum, that felt so long the last year, went by very quickly today. I couldn't believe how soon we reached the 5K mark and I appreciated my healthy knee when we passed the four mile sign. That was the moment of truth for me last year, when I debated whether to drop out to protect my knee. I maintained a steady pace as I made my way up Post Road to Jericho Turnpike, stopping for the briefest time to grab water to wash down some GU Roctane I had put in my gel flask. That turned out to be a great way of managing fuel. I hit the 10K mark in just about an hour and I ran strongly through the next few miles. At one point, on Brush Hollow Road, a band was playing a fast tempo blues song that perfectly matched my cadence. Although I usually prefer silence when I run, I appreciated all the live bands that played for us today. When I reached Wantagh Parkway I was still feeling good, but the sun had come out and the entrance to the Parkway was the steepest incline we'd yet encountered. I made it up fine and enjoyed some of the downhill sections, although one uphill section went on for a while. All along the race, I thought about the quote: "Run the mile you're in" and that helped me focus on the moment, instead of thinking about the miles ahead. Once we hit Carmen Avenue I was pretty psyched because I knew that I would beat last year's time by a measurable amount. I was careful not to mistake the full marathon's 24 mile marker for a sign that we'd reached 12 miles (like I did last year) and when I saw the 11 mile marker, I knew I had enough in reserve to finish with some strength. We entered the park and I actually needed to pass some runners on the narrow pathway. I saw my dentist up ahead and greeted him as I caught up. I yelled "Let's go!" and we picked up the pace. He was able to sustain it, but I needed to drop back to my previous pace after a couple of minutes. I knew when I was getting close to the end, and started to feel some excitement. 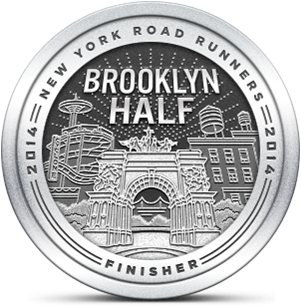 My Garmin said 2:04 and I knew I had a good chance of breaking 2:10, which was my stretch goal. The last quarter mile was hard and the crowd along the path was deep and LOUD. I saw the finish line and put in as much effort as I could until I crossed. I was in so much better shape than last year at the end. I saw TC, who had nailed the distance in 1:50, waiting near the line. We celebrated each other's performances and made our way slowly to the Finish Line Festival. The crowds were so thick that we decided to skip the festival and head to the UPS trucks to get our stowed gear. We had no clue where to find our cars, so we walked around for over thirty minutes until we finally located the lot where we'd parked. I thought back to last year when I could barely handle the ten minute walk to my car after the race. A foot soak with Dr. Bonner's peppermint soap helped a lot this afternoon and I'm going to take a couple of days off from running to recover. I am pleased and happy with today's race and I'm proud of my friends who also ran today. Is it realistic to think that I could break 2:00 in a half marathon some day? I'm not sure I can, but after today's race, I can considerate it a possibility.